A “bird-friendly” laboratory building that doubles as a bridge over a campus ravine is the centerpiece of a multi-building “science commons” that Richard Olcott/Ennead Architects has completed for Vassar College. Earlier this month, college leaders held a dedication ceremony for the $125 million project, which consists of four technologically advanced facilities for teaching and research at the liberal arts college, founded in 1861 and located in Poughkeepsie, New York. 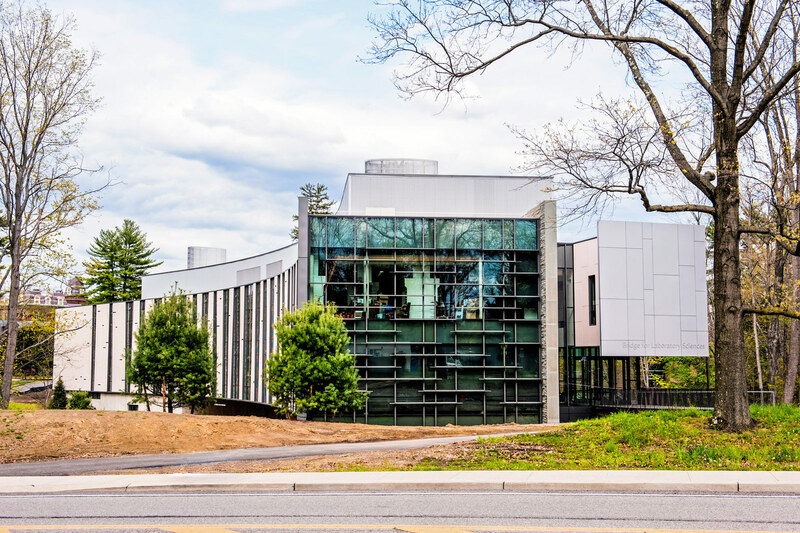 The “Integrated Science Commons,” as it is officially called, includes the Bridge for Laboratory Sciences, a gently curving, 82,000-square-foot structure that spans a ravine and stream called Fonteyn Kill, and three older buildings that have been renovated. The renovated buildings include the New England Building, Olmsted Hall of Biological Sciences, and the Sanders Physics Building. Together, the four buildings form a new campus precinct that’s intended to strengthen the college’s interdisciplinary approach to the sciences and help students and faculty keep up with the latest advances. “The completion of the Integrated Science Commons marks an exciting moment in the history of the sciences at Vassar, and will be a linchpin for the college as the sciences advance and evolve in the coming decades,” said college president Catharine Hill. 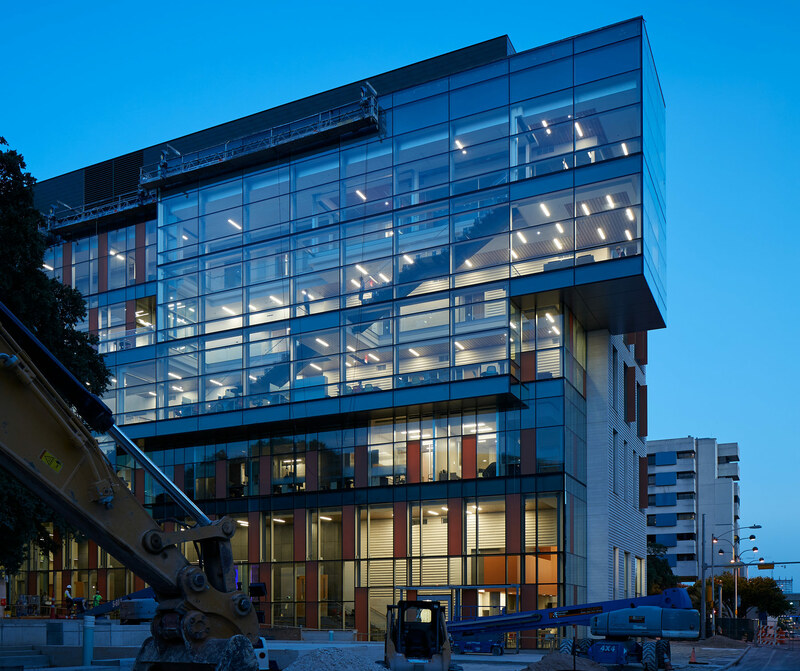 “When the building designs were being developed, we…asked our faculty to anticipate changes in their fields and what they will mean for instruction and research. As a result, the facilities in the Integrated Science Commons are built to be flexible to needs that lie ahead.” At the center of Vassar’s 10-acre science precinct, the Bridge for Laboratory Sciences was designed to be a gathering spot for the campus as well as a teaching facility. By spanning a ravine where few ventured before, The Bridge provides the first accessible walking path at grade between the central campus and destinations to the south, such as the Skinner Hall of Music. Its atrium, with a café and ample seating, is a new Vassar destination. Its façade, clad in fiber cement and stone, was inspired by the wooded landscape and includes “bird-friendly” glass features designed to prevent birds from flying into it. “The Bridge for Laboratory Sciences is an experiential building,” said Ennead partner Richard Olcott, who led the design effort along with management partners Guy Maxwell and Timothy Hartung and project designer Kate Mann. “From the birch tree pattern of the building’s façade to the central corridor with panoramic views out to the natural landscape below, this is a true building in the trees. Its curvature withholds a full view of the entire building, prompting visitors to slowly experience each part of the building as it unfolds.” “As architects, we like to think about how people experience…our buildings,” Olcott said. “When you walk into a straight building and see a long passageway with a door at the end, there is no reveal, merely a sense of obligation. A sense of discovery is important to engage and propel you along on your journey. Walking through the curve of the Bridge, the ground suddenly falls out from below you and you are looking not towards the exit but out at treetops, experiencing the building as if you are in the trees.” “The curvilinear design also figuratively parallels the research that takes place daily in the Bridge,” said Mann, an associate partner with Ennead. “Every day there is a new discovery, a changing landscape, both inside and out.” With the Bridge for Laboratory Sciences, planners say, Vassar and Ennead (pronounced any-ad) have produced a facility that meets multiple goals. As the new home of the chemistry department, the Bridge makes possible experiments using state-of-the-art instrumentation for molecular structure determination, spectroscopy, chromatography and other specialized techniques. In the Bridge’s role as a multidisciplinary site, chemistry faculty and students share the new Earth and Environment Lab with colleagues from biology, environmental studies and earth science in a space designed to serve their common scientific needs. Similarly, the college’s longstanding interdisciplinary robotics research laboratory now has a permanent home in the Bridge. Administrators say it’s a first-of-its-kind collaboration at a liberal arts college, bringing together biology, cognitive science and computer science professors and students. Identifying the right site for this large structure was a key to advancing the college’s goal of promoting collaboration across scientific disciplines. At the same time, planners say, Vassar wanted the “footprint” of the building to fit in well with the scale of adjoining buildings and with its wetland location. Built like a bridge, the new structure rests on two 20-foot-tall concrete piers to span nearly 400 feet across the campus ravine. These piers support a pair of curving trusses at the topmost level. In turn, the two floors below are hung from six-inch steel pipes, creating a structure that is very lightweight and open for its size, thereby minimizing the building’s impact on the ground and preserve the natural landscape underneath. The building’s curved form meanders through the woods, integrated with the natural landscape. Its interior passageway provides panoramic views of the surrounding area, while creating a central corridor for student activity. According to the architects, it is meant to be a conduit, drawing students through it and providing an efficient route between the campus core and remote parking. It also provides multi-disciplinary laboratories and suites designed to foster collaboration between departments, researchers and students from different fields of study. “The Bridge Building invites movement, and in so doing reinforces the accessibility of the sciences to all of Vassar’s student body—a primary goal of the project,” Olcott said. Vassar and Ennead worked with Michael Van Valkenburgh Associates to establish a landscape plan that will help rehabilitate the wetland ecosystem surrounding the Bridge, improve the water quality of the wetland’s stream, and provide a storm water management system for the site. Because the Fonteyn Kill wetland is a haven for numerous bird species and on an avian flight path, the architects incorporated façade features to minimize bird collisions, an idea championed by Maxwell. Among these features on the southeast façade is the first major application in the U.S. of Ornilux Mikado glass, with a patterned ultraviolet reflective coating that is visible to birds but remains virtually transparent to the human eye. Glass on the northwest façade also has an innovative coating and custom frit pattern designed by Ennead. Frits in glass are also a tool for modulating solar glare and heat gain within a building and are among the elements used to improve energy performance throughout the Bridge for Laboratory Sciences. The other buildings provide an additional 75,000 square feet of renovated space for teaching and research. Vassar faculty began discussions about the need to bring the college’s facilities more in line with its vigorous science curriculum more than a decade ago. Among the benefits of the Integrated Science Commons, planners say, is access for faculty and students to a new array of resources. Design decisions throughout the Integrated Science Commons, they say, broke down the old divide between the classroom and the lab and resulted in integrated scientific spaces where instruction, experimentation and discovery can be accomplished “fluidly.” New “wet” and “dry” labs are equipped for faculty-led research in such subjects as ultra-thin materials, behavior genetics and health psychology. Other labs are designed to serve the needs that intersect among multiple disciplines. Improvements also make possible more extensive use of advanced experimental equipment, such as Phytotron growth chambers and an X-ray source diffractometer. Another key outcome of the project is centralization of most of the locations for the Vassar science curriculum, which were previously scattered across the campus. The departments of biology, chemistry, cognitive science, computer science, physics, astronomy, and psychology as well as the biochemistry and the neuroscience and behavior programs, all reside now within the Integrated Science Commons. By bringing these departments and programs closer together, planners said, Vassar fosters greater collaboration among faculty and students. “These new and enhanced facilities ensure that Vassar students will continue to learn in a current and dynamic hands-on environment,” Hill said. “And they equip our outstanding faculty to teach and conduct research to the best of their abilities and to serve as the best possible mentors for our students.” Other Ennead design team members for the Integrated Science Commons included: project architects Todd Walbourn and Theresa O’Leary; Charmian Place for interiors and Kathleen Kulpa as technical director. Also on the design team were Christina Ciardullo, Edgar Jimenez, Hiroko Nakatani, Tom Offord, Yong Kyun Roh, Constance Vale, Hans Walter, and Desiree Wong. In designing the new science commons, the architects and college planners determined that one campus building from the early 1980s was “failing” and chose to demolish it. The Seeley G. Mudd Chemistry Building, a Postmodern structure by Perry Dean Rogers & Partners of Boston, was torn down earlier this year, and the land will be maintained as green space. Architects deliver a North American first with Warren Woods Ecology Field Station. When Belfast, Maine–based architecture firm GO Logic presented the University of Chicago's Department of Ecology and Evolution with three schematic designs for the new Warren Woods Ecology Field Station, the academics decided to go for broke. 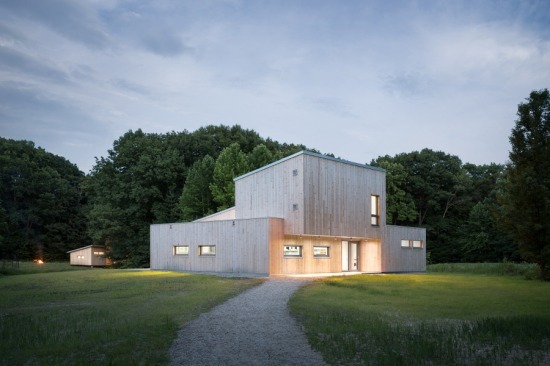 Despite being new to Passive House building, the university was attracted to the sustainability standard given the laboratory's remote location in Berrien County, Michigan. "We presented them with three design options: one more compact, one more aggressive formally," recalled project architect Timothy Lock. The third option had an even more complicated form, one that would make Passive House certification difficult. "They said: 'We want the third one—and we want you to get it certified,'" said Lock. "We had our work cut out for us." Thanks in no small part to an envelope comprising a cedar rain screen, fully integrated insulation system, and high performance glazing, GO Logic succeeded in meeting the aesthetic and environmental goals set down by the university, with the result that the Warren Woods facility is the first Passive House–certified laboratory in North America. Warren Woods' envelope begins at ground level, with a shallow foundation utilizing GO Logic's patented L-shaped EPS insulation around the edges, and a continuous air-seal layer between the foam and the slab. "The system allows us to pour consistent slab-on-grade without any thermal bridging," explained Lock. The sealing layer connects into the wood stud wall backed by graphite-impregnated Neopor insulation. The architects chose the insulation for its high R-value, knowing that they would need to compensate for the relatively large amount of surface area dedicated to the exterior wall. Pro clima one-way breathable building paper allows the building to expel moisture. GO Logic installed a rain screen of Eastern White Cedar vertical gap siding sourced from the Upper Peninsula "because of the aesthetic goals of the client," said Lock. "They desired a contemporary aesthetic but also [the look of] a Midwestern barn." The architects planned the interior space and allotted glazing judiciously, locating the laboratory on the north side of the building. Its position, under the cantilever over the entry, maximally reduces solar gain—an important consideration given the heat generated by the equipment inside. The classroom space, on the other hand, is positioned on the building's south side, punctuated by a long strip of Kneer-Südfenster glazing. "We are highly critical of windows that are available domestically," said Lock. "The big drawback with North American windows is that the tradeoff for a higher R-value is significantly reduced solar heat gain." Instead, the firm imports Kneer-Süd's products directly from Germany. "In Northern Europe they know how to get all the heat from the sun that they can," he observed. "We also love the way they look." The windows and doors are fully integrated into the air-seal layer using one-way breathable tapes from SIGA, imported (like the pro clima paper) through 475 High Performance Building Supply in Brooklyn. A custom-fabricated stainless steel accordion screen shields the classroom-side glazing from both intruders and the sun. "It's good for security—the university likes that," said Lock. "But the screen was also big for us to control the amount of heat that enters during the summer months and shoulder seasons." The idea, he explained, is that when classes are in session and the weather is nice, the occupants can throw open the doors. When only the laboratory is in operation, the closed screen will cut back on heat gain. In addition, the steel mesh "became something that was also a really exciting design feature," said Lock. "It had a great effect—not just cooling the space, but also softening the natural light."